Unused space above your garage or spare land adjacent your house? A two storey side extension could provide the extra bedrooms, second bathroom, kitchen or shower room for the expanding family, or the badly needed study away from the hustle and bustle of the common living areas. Two storey side extensions often lack light or look out onto a fence or a neighbour's courtyard but it does not have to be this way. We specialise in designing and building extensions to Victorian terrace properties that have side returns, we have a nifty range of roof lights type windows as part of many of our designs. 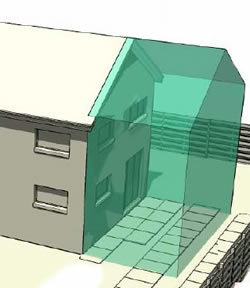 Building a rear or side two storey extension to your house can make good financial sense too. You can significantly improve the value of your house by adding that extra space with kitchen on the ground floor and extra bedroom or bathroom on the 1st floor.